The Ambridge Regional Distribution & Manufacturing Center is an Official Toys for Tots Donation Location! Toys for Tots is collecting new unwrapped toys to help brighten up a child’s holiday. 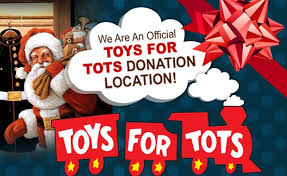 If you would like to make a donation to Toys for Tots, you can drop off your donation at the Leasing Office, Building One, 2301 Duss Avenue, Ambridge, PA 15003, Monday through Friday 8 am to 4:30 pm until December 1, 2018. The donation box in our main hallway. Your generosity is greatly appreciated.